Portable thermometer for contact measurement from -50ºC to 1300ºC. Register of maximum and minimum values. Auto switch-off after 7 seconds. Supplied with rubber protector, battery and operating instructions. Immersion / penetration probe (K type thermocouple) in stainless steel. Dimensions: 100x3 mm. Spike ended, with handle and one metre of PVC flexible cord, ended in a mini connector. Measure range: -40ºC+400ºC. Suitable to measure aire temperature, soft solids, dust and liquids. 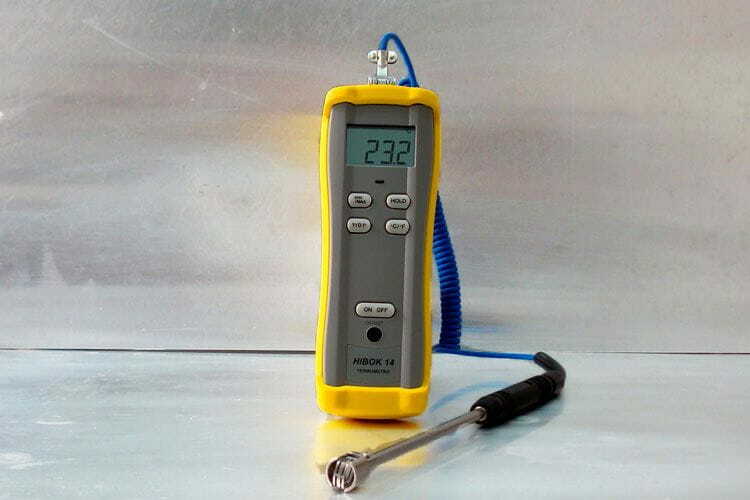 Contact probe (K type thermocouple) in stainless steel. Dimensions: 150x6 mm. strip ended, with handle and one metre of PVC flexible cord, ended in a mini connector. Measure range: -40ºC a +500ºC. Suitable to measure temperature on flat surfaces. In addition to these two standard probes other probes of any type and size can be supplied upon request.